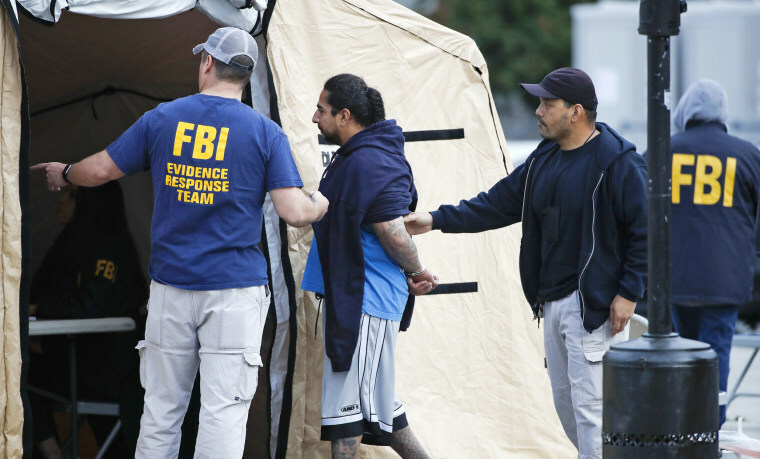 More than 40 suspected members of the notorious MS-13 gang faced federal charges Wednesday in Los Angeles in what law enforcement officials called one of the most significant busts of the transnational gang in its notorious decades-long history. The 44 alleged members and associates included a former head of the entire gang in Los Angeles and a dozen high-ranking members, the U.S. Attorney's Office of Los Angeles said in a statement. At least 21 people were arrested without incident Wednesday morning, according to the statement. Some 20 suspects, already in state custody, were transferred to federal custody. Three of those facing charges are considered fugitives. The defendants face federal charges for murder, extortion, drugs and weapons-related crimes. The high-ranking leaders were "shot-callers" and others who made up what law enforcement officials described as a leadership council of MS-13. Thirty-four of the defendants facing charges were named in a racketeering indictment unsealed Wednesday. In addition to those named in the indictment, authorities filed a drug-trafficking indictment against five other alleged gang members associated with the Mexican mafia and had arrested others on separate charges. The takedown capped a three-year investigation involving nearly two dozen law enforcement agencies led by the FBI, Bureau of Alcohol, Tobacco, Firearms and Explosives, Drug Enforcement Agency and the Los Angeles Police Department. Those arrested on Wednesday were expected to be arraigned on the charges against them later in the day in United States District Court, according to the statement. Those already in custody would be brought into federal court to face their charges at a later date. Authorities also seized approximately two kilos of methamphetamine as well heroin, according to DEA officials. Nearly two dozen guns were seized as part of the investigation. MS-13, or Mara Salvatrucha, started three decades ago on the streets of Los Angeles, and was originally made up mainly of immigrants and young people from El Salvador who had fled the country's civil war. The gang's tentacles reach into Central America and across the United States. Five years ago, MS-13 was named a transnational criminal organization, making it the first street gang to join the list. The designation gave the U.S. Treasury Department the power to freeze any financial assets from the gang or its members, and prohibits financial institutions from engaging in any transactions with members of the group. The gang has continued to surge, and even with the Los Angeles takedown, MS-13 has also been grabbing recent headlines in the East Coast for a series of brutal murders in the New York City area. Last week, officials said U.S. Immigration and Customs and Enforcement had arrested 1,378 people during a six-week, nationwide sweep targeting gangs — which included 104 people authorities said were affiliated with MS-13. And last month, President Donald Trump singled out the brutal gang as "one of the gravest threats to American safety." Trump previously blamed Obama's administration's immigration policies for letting the gang make inroads in the U.S., but experts cautioned against laying the blame on Obama, and said decades of unchecked violence in Central America had exacerbated the problem.